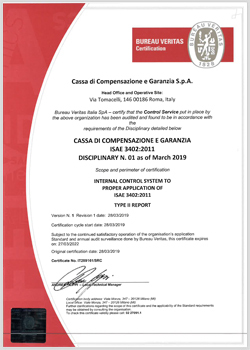 Cassa di Compensazione e Garanzia (CC&G) recently obtained the ‘International Standard on Assurance Engagements (ISAE) 3402 Assurance Reports on Controls at a Service Organisation Type II', a standard for documenting a service organisation's internal controls. ISAE is part of the International Federation of Accountants (IFAC). ISAE 3402 is an assurance standard that was developed to allow public accountants to issue a report for use by user organisations and their auditors. It looks at the controls within a service organisation that are likely to impact or be a part of the user organisation's system of internal control over financial reporting. Additionally, the ISAE 3402 Assurance Report is issued by independent auditors who are responsible for evaluating the description, design and operational effectiveness of best practice controls. Verification of the standard refers to a COBIT (Control Objectives for Information and related Technology) that was based on documents presenting CC&G's control system for providing IT services to user organisations from 1st January 2018 to 31st December 2018. What does this mean for CC&G? The assurance report and the thorough nature of the audit by user organisations has recognised CC&G as improving the processes of governance and helped to create an increased awareness of the services it provides.